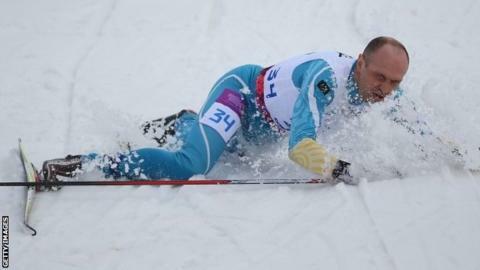 Ukraine claimed their first gold medal of the Sochi Winter Paralympics as Vitaliy Lukyanenko won the 7.5km visually impaired biathlon. The 35-year-old beat Russia's five-time world champion Nikolay Polukhin, the pre-race favourite, by 11 seconds with Vasili Shaptsiaboi of Belarus third. Ukraine had considered a boycott of the Sochi Games in protest at Russia's occupation of Crimea. But on Friday they decided to compete, and 24 hours later won five medals. They were only represented at Friday's athletes' parade at the opening ceremony by flagbearer Mykhaylo Tkachenko, and Ukraine Paralympic Committee president Valeriy Suskevich warned any escalation of military conflict would result in the team leaving. Lukyanenko's gold added to a silver and three bronzes won by his team-mates in the other biathlon events on Saturday morning at the Laura Cross-Country and Biathlon venue. Russia top the medal table after the first day of action, with four golds, six silvers and two bronzes, after victories in the biathlon for Roman Petushkov (7.5km seated), Elena Kaufman (6km standing), Vladislav Lecomtcev (7.5km standing) and Mikhalina Lysova (6km visually impaired), while Germany's Andrea Eskau prevailed in the 6km seated event. On the slopes, America's London 2012 track cycling gold medallist Allison Jones won the eighth Paralympic medal of her career with bronze in the standing downhill behind France's Marie Bochet. Two years ago, Jones won the C1-3 time trial at the Olympic Park Velodrome. Spain's Jon Santacana Maiztegui recovered from six months out with an Achilles injury to win the men's visually impaired downhill, while Japan's Akira Kano won the seated category. Germany's Anna Schaffelhuber took victory in the women's seated event, while Austria's Markus Salcher got his campaign off to a winning start in the men's standing race.